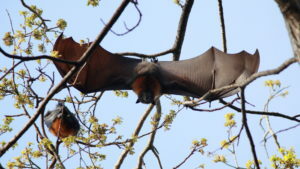 Mr. Save Lucy is visiting Australia and has been photographing gray headed flying foxes. We think this is a nice photo to accompany Blogger Rachael’s poem, even if they don’t eat bugs or echolocate. Photo by Rich Sturges, 2017. 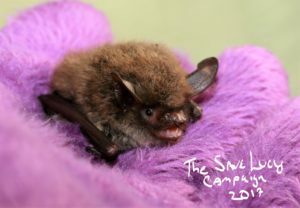 On the other end of the spectrum, a Northern Long-eared bat, also photographed by Mr. Save Lucy. This one DOES echolocate and eat bugs. Photo by Rich Sturges. Hi everyone! I hope you all had a good week. I would like to dedicate this week’s blog to the people affected by the fires in Northern California. I hope that weather brings you some rain soon and the fires can be brought under control. My thoughts are with you all. I am studying poetry in my English class. One of my assignments was to research a famous poet and then to write an original poem using that poet’s style. I researched William Blake, so I decided to try and copy the style he used in his poem “The Tyger”. I wrote about the misunderstood and underappreciated bat that people often call “ugly”. It was difficult to write because, well, bats are adorable! I needed inspiration and as you all know, little bats are very poetic. So, with their inspiration, but definitely not their talent, I managed to write a poem that I would like to share with you all now. I hope you like it. How do you see them from so far, not near? A life of service. Don’t you see? Next StoryBat Week! Bat Week! Bat Week!